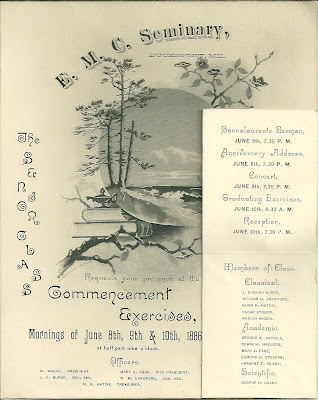 1886 Commencement Program, E. M. C. Seminary, Bucksport, Maine. Mornings of June 8th, 9th and 10th, 1886 at half-past nine o'clock. The East Maine Conference Seminary was established by the Methodist Church in 1848 in Bucksport, Maine. The school closed in 1934. The program consists of one piece of thick stock with a smaller folded piece attached to it. 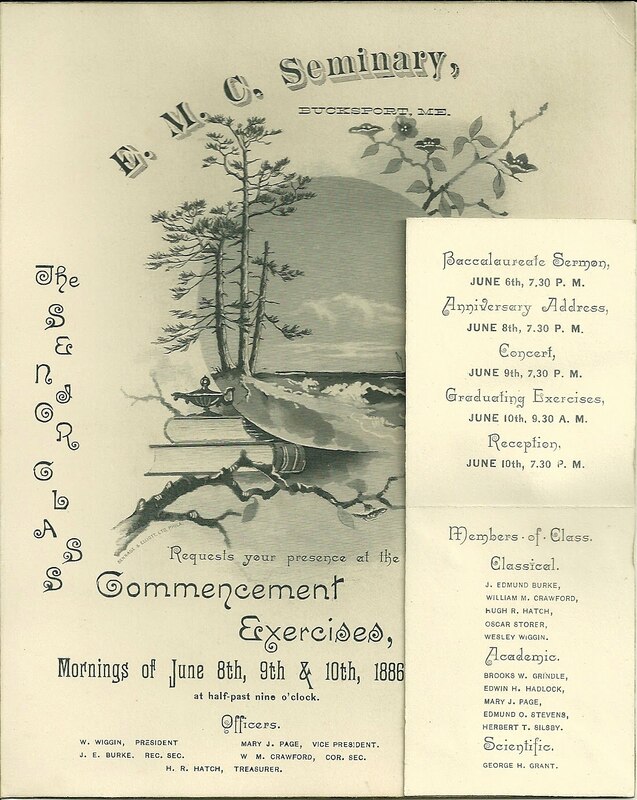 The image below shows the program with the flap unfolded. J. E. Burke, Rec. Sec. W. M. Crawford, Cor. Sec. 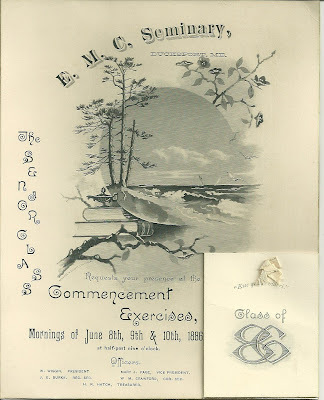 Baccalaureate Sermon, June 6th, 7:30 P.M. 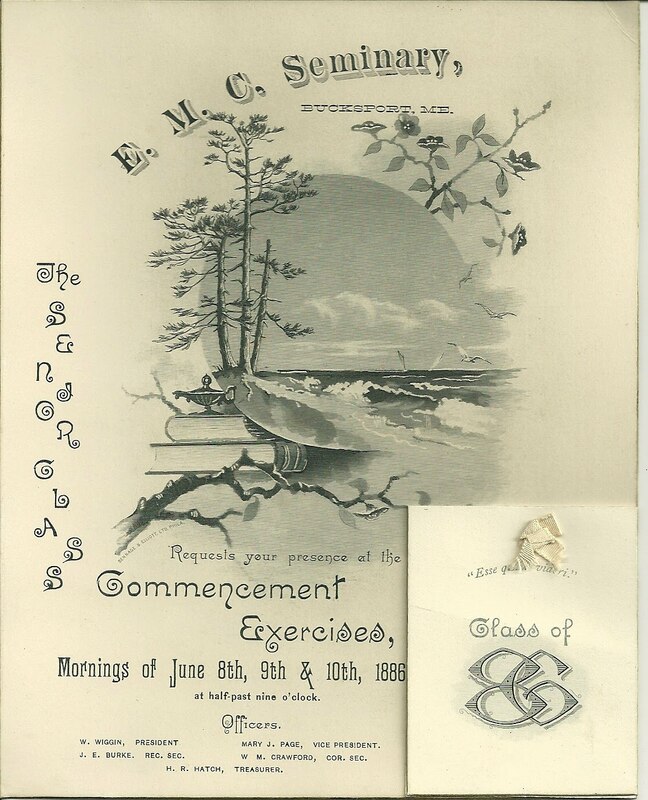 Anniversary Address, June 8th 7:30 P.M.
Concert, June 9th, 7:30 P.M.
Graduating Exercises, June 10th, 9:30 A.M. Reception, June 10th, 7:30 P.M.
Hopefully you will find a name or two on this list that is meaningful to you. Thanks for stopping by!